8x10, from Joe Wershba. Photo undated, approximate. 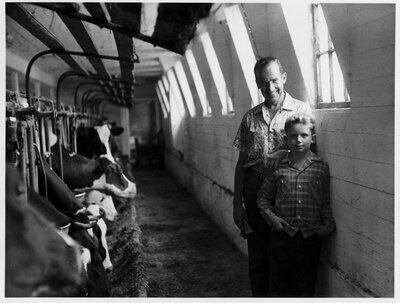 Typed paper attached to back "I have become a farmer in my spare time, and having graet fun with it 280 acres, milking 42 head of Line Bred Holstein and banging the typewriter to pay the deficit," Murrow wrote on August 23, 1955.